He is Baby Monkey, Private Eye! if he can put on his pants! Brian Selznick's books have garnered countless accolades worldwide, and have been translated into more than 35 languages. He is the Caldecott Medal-winning creator of the #1 New York Times bestsellers The Invention of Hugo Cabret, adapted into Martin Scorsese's Oscar-winning movie Hugo; and Wonderstruck, adapted into the eponymous movie by celebrated filmmaker Todd Haynes, with a screenplay by Selznick; as well as the New York Times bestsellers The Marvels and Baby Monkey, Private Eye. Most recently, he illustrated the 20th anniversary paperback edition covers of J.K. Rowling's Harry Potter series. David Serlin is a writer, editor, and historian who teaches at the University of California, San Diego. 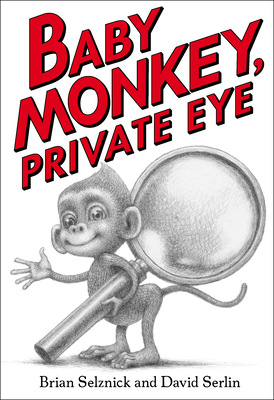 He is the author or editor of numerous books and articles for adults, as well as the co-author of the highly acclaimed Baby Monkey, Private Eye. Brian and David divide their time between Brooklyn, New York and San Diego, California.